hand engraved grips grips. This is the latest, and current design. 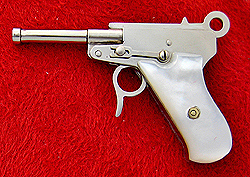 1-15/16" OAL The Luger is made ofnickel plated steel with hardened trigger and hammer. 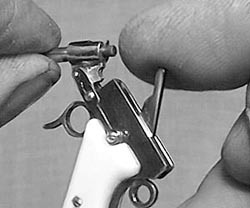 The barrelisbrass and breaks to load. There is a traditional side spring to hold the barrel in the locked position. This is a sturdy gun, and the best "shooter" among my guns. 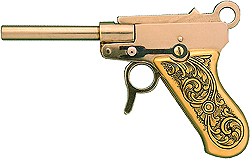 Luger with stained pear grips With Mother of Pearl grips.